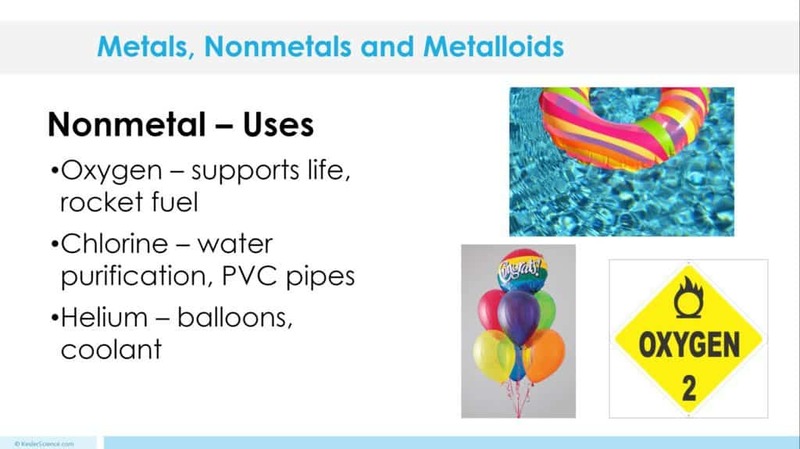 At the end of this metals, nonmetals, and metalloids lesson plan, students will be able to compare metals, nonmetals, and metalloids using physical properties such as luster, conductivity, or malleability. Each lesson is designed using the 5E method of instruction to ensure maximum comprehension by the students. 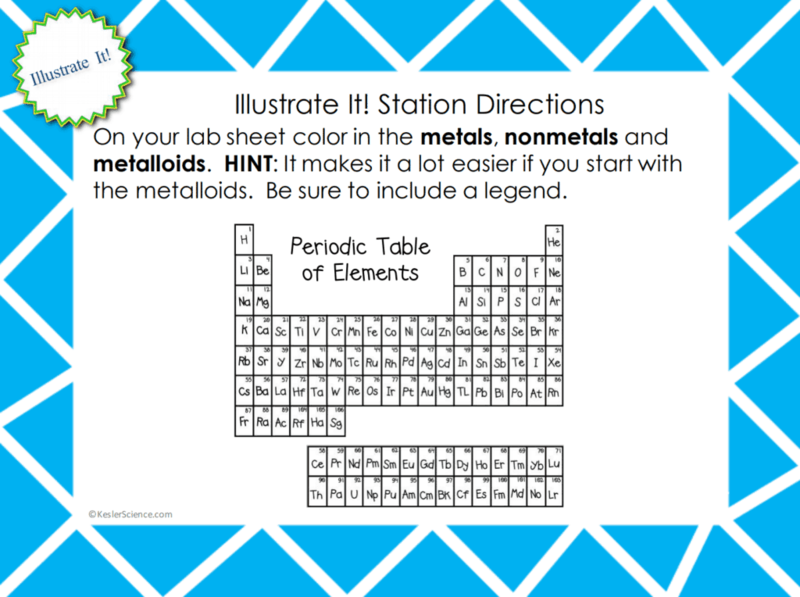 The following post will walk you through each of the steps and activities from the metals, nonmetals, and metalloids lesson plan. Have students brainstorm a list of properties for each object. Guide them into understanding that these can be classified as metals and nonmetals. Hold up a metal object and a nonmetal object. Ask the students to list differences between the two objects. Hold up two metal objects. Ask students to list similarities between the two objects. 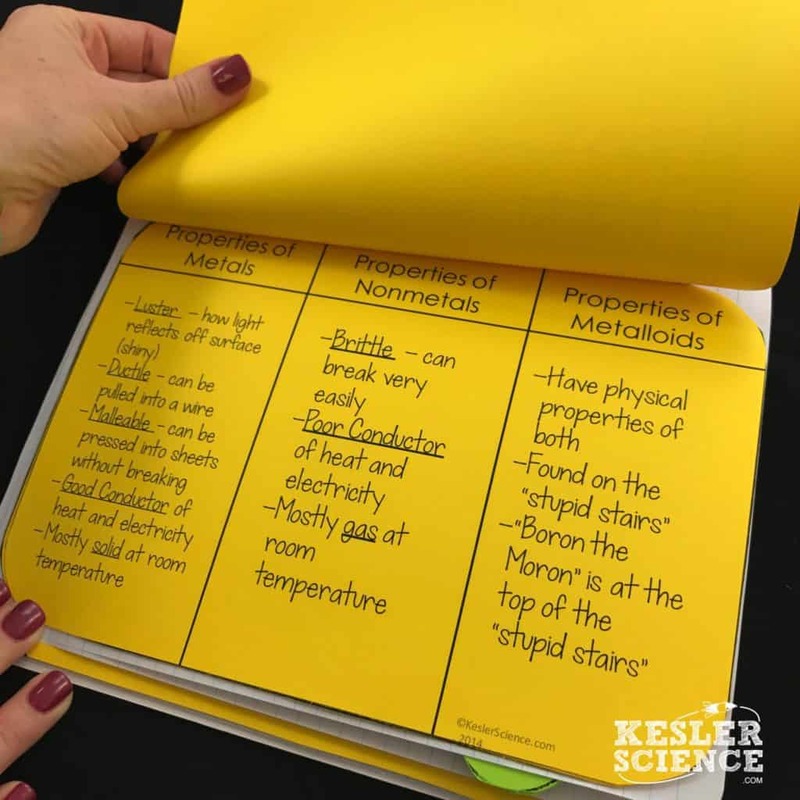 Have students go back to the list created when they brainstormed about the original group of objects you showed them, and come up with a list of properties for metals and a list of properties for nonmetals. 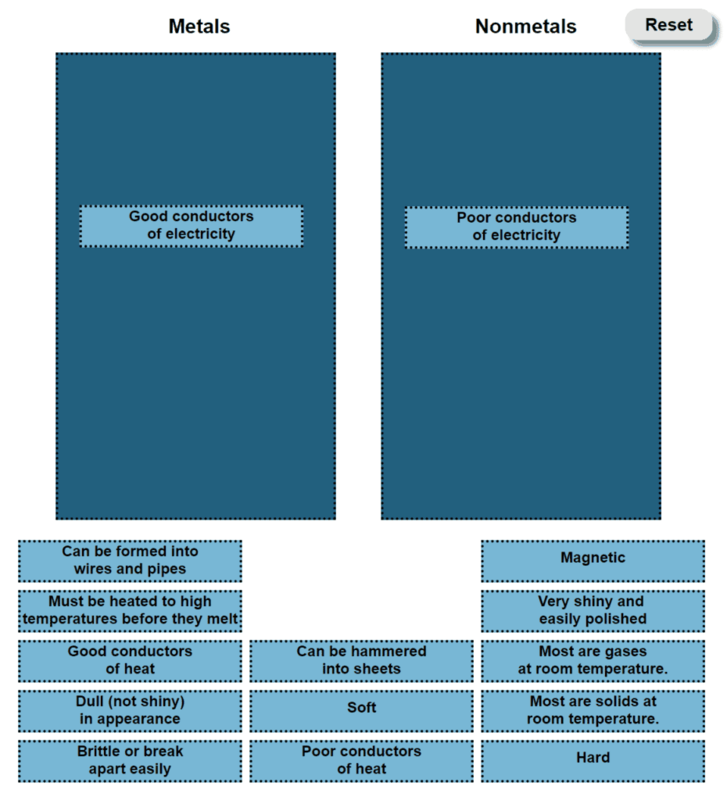 The teacher will help to clear any misconceptions about metals, nonmetals, and metalloids. A major misconception is students don’t realize that the periodic table organizes metals, nonmetals, and metalloids. This student-centered station lab is set up so students can begin to explore metals, nonmetals, and metalloids. 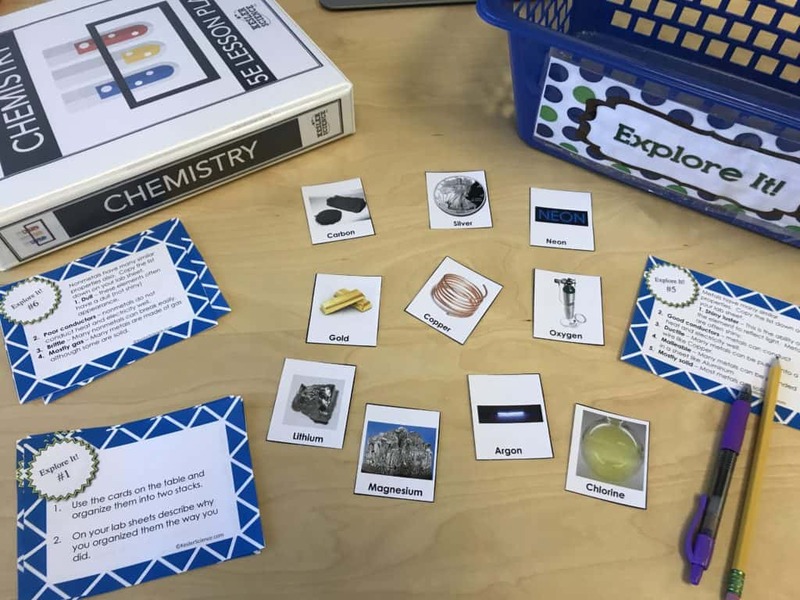 Four of the stations are considered input stations where students are learning new information about metals, nonmetals, and metalloids and four of the stations are output stations where students will be demonstrating their mastery of the input stations. Each of the stations is differentiated to challenge students using a different learning style. You can read more about how I set up the station labs here. 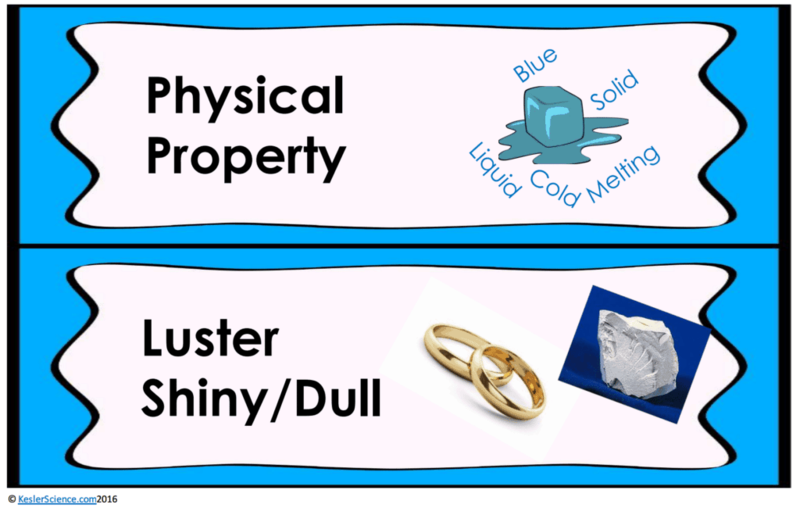 Students will be working in pairs to organize a stack of cards by their unique physical properties. Students will identify what is displayed on the card as either having physical properties that classify them as either metals or nonmetals. Students will also determine if any of the cards could be labeled as being a metalloid. At this station, students will be watching a five and a half minute video explaining the physical properties of metals and nonmetals. Students will then answer questions related to the video and record their answers on their lab station sheet. For example: What side of the periodic table are metals and nonmetals found? 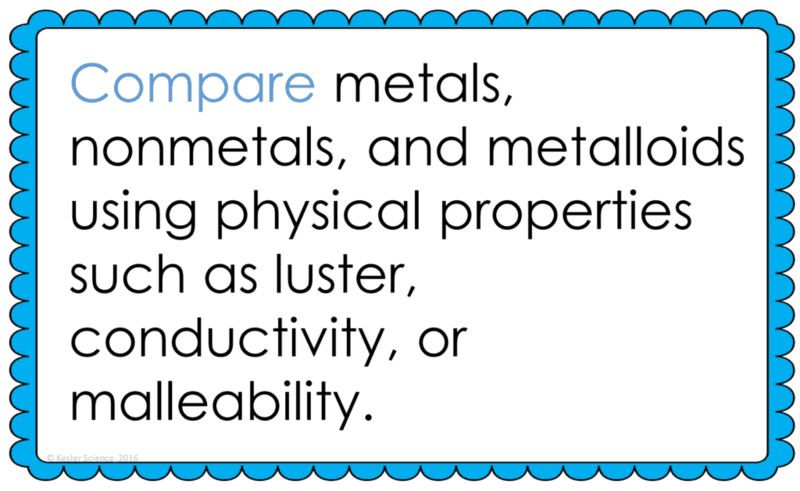 Describe the difference between dull and luster and identify which property metals have. What does malleable mean? Which is more malleable, metals or nonmetals? The research station will allow students to interact learning the differences between the three main types of elements. Students will interact with a web page that allows students to organize properties of substances or objects as either a physical property or chemical property. Students will then be directed to watch a short video about metalloids and answer a few follow-up questions. This station will provide students with a one page reading about semiconductors. In the reading, students will discover how most of the products they use today are made of metalloids. They will read how metalloids have properties of both metals and nonmetals. There are 4 follow-up questions that the students will answer to show reading comprehension of the subject. The assess it station is where students will go to prove mastery over the concepts they learned in the lab. The questions are set up in a standardized format with multiple choice answers. Some questions include: Which of the following is not a characteristic of a metal? What would be the best element for a specific job? What is the difference in physical properties between Oxygen and Gold? Carbon has all of these physical properties except what? Students who can answer open-ended questions about the lab truly understand the concepts that are being taught. At this station, the students will be answering three task cards: Explain how metalloids are different from metals and nonmetals. Explain how the periodic table is organized based on physical and chemical properties. Where are the metals, nonmetals, and metalloids located on the periodic table? Describe the physical properties of Copper (Cu) based on what you know about metals, nonmetals, and metalloids. Your visual students will love this station. Students will color in, on their lab sheet, where one could find metals, nonmetals, and metalloids. Students will also create a key that explains what the colors represent. 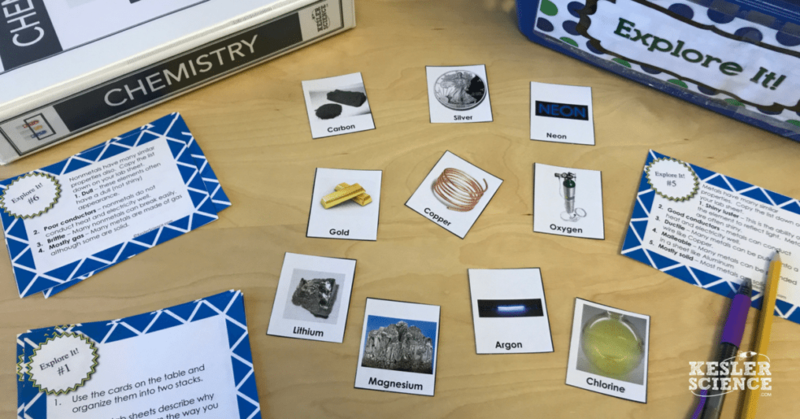 The organize it station allows your students to place cards under columns that represent physical properties as either those of metals, nonmetals, and metalloids. Shiny luster, brittle, properties of metals and nonmetals and just a few cards that students will be working to organize. The explanation activities will become much more engaging for the class once they have completed the exploration station lab. During the explanation piece, the teacher will be clearing up any misconceptions with an interactive PowerPoint, anchor charts, and interactive notebook activities. 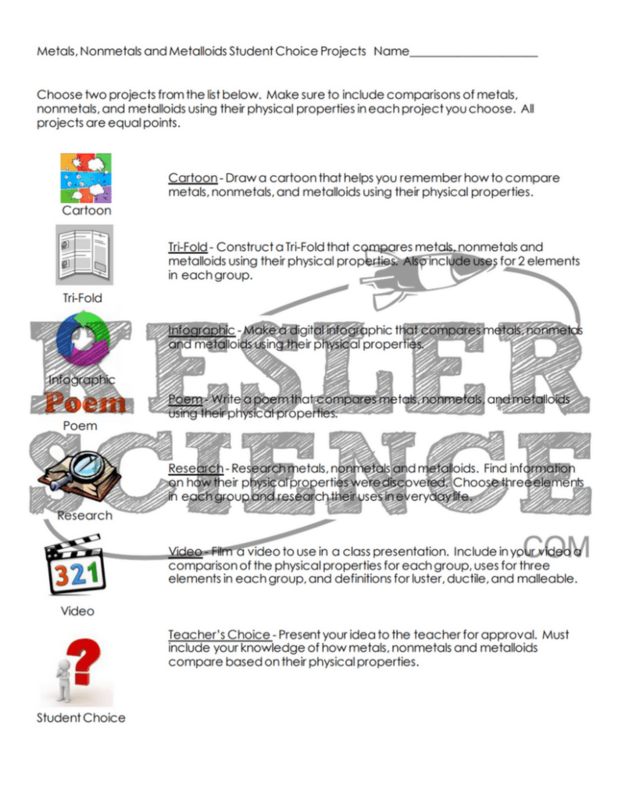 The metals, nonmetals, and metalloids lesson includes a PowerPoint with activities scattered throughout to keep the students engaged. The students will also be interacting with their journals using INB templates for metals, nonmetals, and metalloids. Each INB activity is designed to help students compartmentalize information for a greater understanding of the concept. 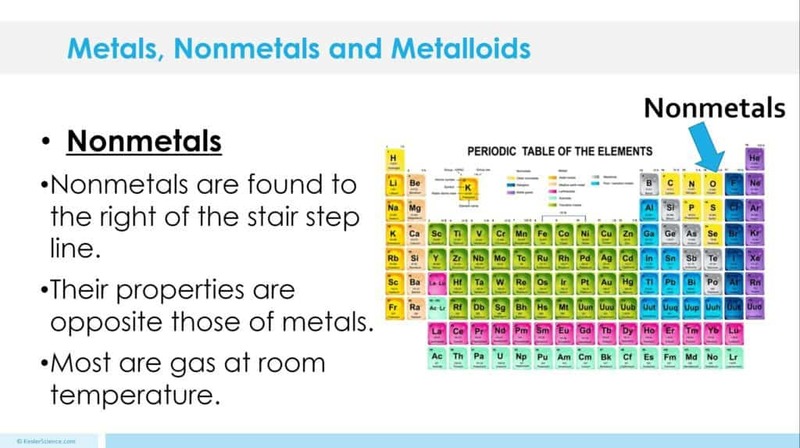 The metals, nonmetals, and metalloids INB templates allow students to focus their notes on learning to identify where to find metals, nonmetals, and metalloids on a periodic table, and it includes space for notes on metals, nonmetals, and metalloids.